Family Matters is pleased to welcome our February guest blogger, Blair Gatehouse, Digital Resources Graduate. 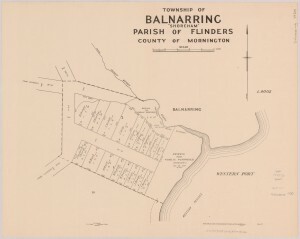 While maps may not be the first resource that spring to mind when investigating your family history, the State Library of Victoria holds a wealth of map resources which may be very useful for your research. Late last year we published a research guide to using maps for family history, which will take you through some of these key resources. Many of the maps in our collection have been digitised, making it easy to conduct your research from home. Maps can be useful for family history research in a variety of ways. They can provide specific information, such as the location of a town, a block of land your ancestor purchased, or street numbering from a different time period. Additionally, they can add context to your research. By looking at a map of a place your ancestor lived you can form a picture of the life they may have lived. For example, a town plan showing features such as houses, businesses, churches and schools can help you to understand the kinds of jobs and educational opportunities that were available. The most popular collection of maps among family historians is our collection of township, parish and county plans. These maps recorded information about the transfer of land from the Crown (the Government) to private ownership or lease-hold. 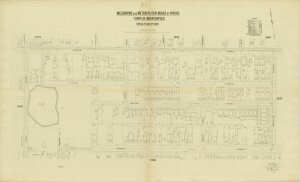 They show the boundaries of lands which were occupied, reserved or sold, along with the date of purchase, the acreage and, post 1862, the relevant file number for that selection or sale. Because they feature the names of those who purchased land, they are an invaluable resource for family historians. 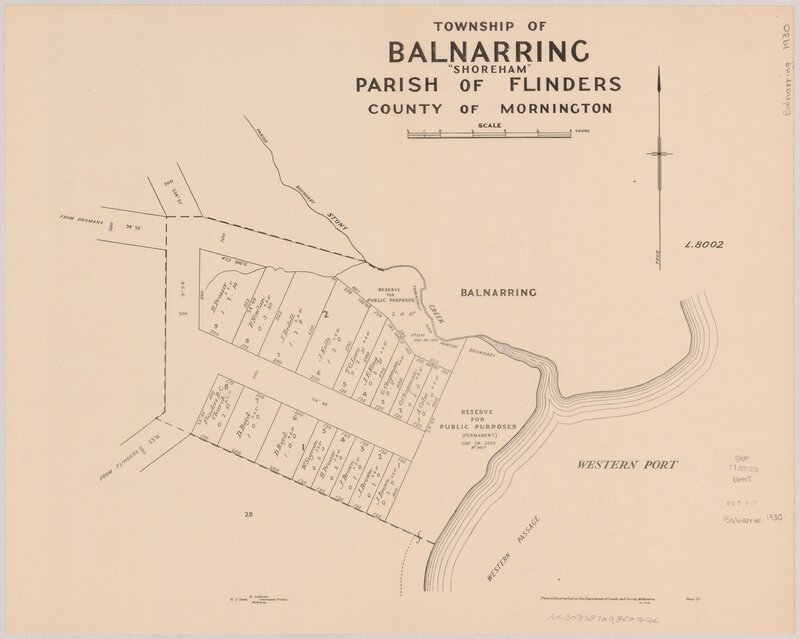 A great resource for researching your ancestors who lived in Melbourne are the maps produced by the Melbourne Metropolitan Board of Works (MMBW). 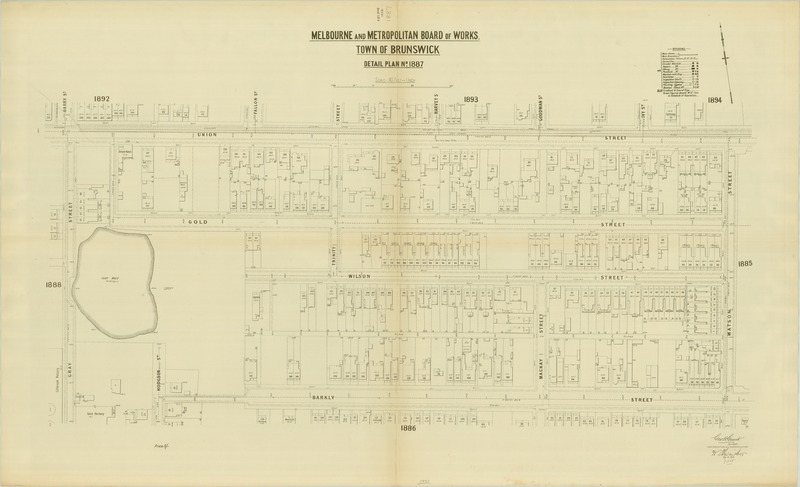 Originally drawn up to aid in the design and development of Melbourne’s sewerage system, they provide a historical record of Melbourne streetscapes and environmental features. These maps can help to identify where people lived, in areas where street names and features may have since changed. They can be especially useful for locating house numbers in streets where the numbering has since changed. Some even include house names. In addition to these resources, we have many other Victorian maps that can be of use, including auction plans, street directories and maps of pastoral holdings all of which can assist with your family history research. We also have a strong collection of gazetteers, reference books which provide basic information about locations, such as the coordinates and population size. These can be helpful when searching for towns which have changed name or no longer exist. Although the Library’s strength is in maps of Victoria, our research guide also suggests resources which may be useful when tracing your overseas ancestors. If your ancestors are from the British Isles, there are a number of excellent map resources freely available online, including the highly detailed ordnance survey maps for England, Scotland and Ireland. We encourage anyone interested in using maps for family history to have a look at our research guide and explore some of the many resources available.